Daytripping doesn’t mean you have to be up with the roosters, bags packed the night before, with hours spent on dodgy roads getting to your destination. Bo Cap Vang in Dong Nai Province is an ecotourism park approximately an hour and a half by motorbike and ferry from District 1. It’s easy to find and has something for everyone for an enjoyable day trip. 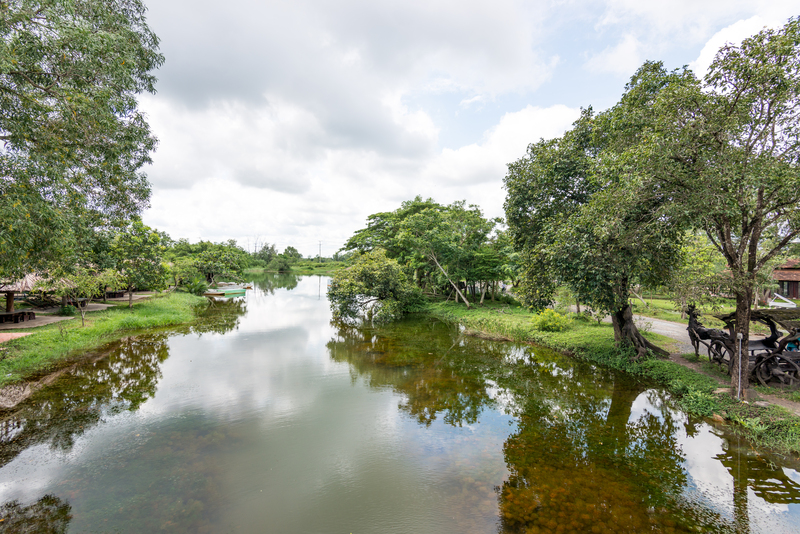 The park is on the banks of the Keo Canal, a tributary of the Dong Tranh River that snakes its way southeast from Saigon towards Vung Tau and acts as the border separating the provinces of Dong Nai, Ho Chi Minh City and Ba Ria-Vung Tau. Bo Cap Vung offers food, camping, team building opportunities, swimming and water activities, wedding parties and, dubiously, quadbiking, although it’s not immediately clear where that takes place at the site. There’s oodles of shade and the river has some of the cleanest water you’ll see in these parts. Bo Cap Vung is accessible via the Cat Lai ferry from Cat Lai Port and is the closest ferry to people living in District 2. However, the best route for people living on the opposite side of the Saigon River — most of us — is to get yourself to Binh Khanh Ferry Terminal at Nha Be, right by District 7 at the end of Huynh Tan Phat Street. This street connects (in a roundabout way) to Nguyen Tat Thanh Street, the street that runs alongside the port in District 4. We arrived at the ferry station at about 7.15am and were onboard by 7.30am, ready for a 7.35am departure. A ticket for the 10-minute ride across the river costs VND4,500 per motorbike. They are simple to buy, like at most ferry terminals in Vietnam. Pull up alongside a ticket seller, pay and then hand over the stub as you move your way to the platform. The ferry on the day we went, a Tuesday, was only half-full with motorbikes, small cars and a small truck or two. At weekends, the deck is usually jammed with daytrippers, so if you can, take that day off work you’ve been wanting and enjoy the more laid-back conditions during the week. On the other side of the river, we realised that we had taken the wrong ferry. It turned out that we had departed from the wrong terminal. A quick check of Google maps showed us that we should have arrived at Phuoc Khanh Ferry Terminal, not the terminal at the beginning of Rung Sac, which is a long stretch of road that goes all the way down to the ocean through Can Gio forest. After a quick turn around and another VND4,500, we were back on the ferry that had brought us. It turned out that there is a much smaller terminal nearby where a ferry with a capacity of about 30 motorbikes and some small vehicles takes you the 20-minute ride across the river to Phuoc Khanh. Say Phuoc Khanh to the ferry staff and they will point you in the direction of the terminal just two minutes away. The ferry ride across the Nha Be River was enjoyable with all types of vessels plying the waterway. At one point the skipper backed off the throttle, slowing the old diesel engine to a chug, as the bow waves of a small Vietnamese naval destroyer cruising by threaten to breach our bow. At 8.40am, an hour after riding our first ferry, our tyres were ready to hit the tarmac again. Phuoc Khanh is a surprisingly quaint fishing village worthy of a proper visit. Just outside of town is Pham Thai Buong Street, which is almost 5km long, and doesn’t take too long to ride — take note however, at the time of writing, roadworks ran the length of it. The small dirt track to the side is a much better option. Pham Thai Buong runs into Hung Vuong Street at its end where you turn right and travel approximately the same distance to the turnoff to the road that takes you all the way to Bo Cap Vang. At around the 6km mark, there’s a large green and yellow sign indicating that Bo Cap Vang is just 2.7km away. From here it was an easy ride to our destination, on the way passing some idyllic rice fields and crossing over a quaint bridge, although at one point the vistas were bullied by towering electricity pylons and their power lines that supply electricity to Saigon. As much as anything, a trip to Bo Cap Vung is a nice reminder of how rural Vietnam is still on our doorstep despite the development that goes on unfettered around us.